Recently we launched an event where customers could reset or upgrade their engagement ring setting. This event gives customers a chance to reset their existing diamond from their engagement ring into a new, updated engagement ring setting. 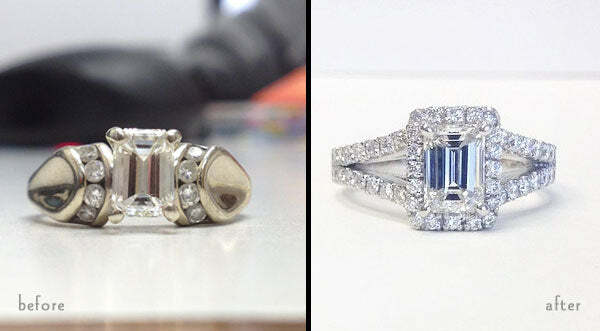 You would be surprised at how using your current diamond and placing it into a newer, more fresh setting can make it look completely different! See this before and after as a perfect example! This also got me thinking that you can also reset your diamond(s) into different pieces of jewelry. Maybe you are wanting a necklace instead of a ring. We just had a client who had a gorgeous 1.50ct round brilliant cut diamond that had been sitting in her jewelry box for years. She decided to remove the diamond from the setting and placed it into a new four prong diamond solitaire necklace. It turned out amazing and it only cost her $225! deBebians.com can be your personal jeweler who can customize anything you have in mind. Go through your jewelry box and find items that can be transformed into new pieces of jewelry. Maybe you don’t have a 1.50ct diamond sitting around, but you have a fun gemstone like a sapphire or amethyst that could be turned into something new! A lot of times you can come up with a new jewelry design and it won’t cost a lot of money to make a new piece. Be sure to check out our page that is dedicated to helping you reset your engagement ring or another piece of jewelry and keep in mind that we can make other styles of jewelry using your existing diamonds and gemstones!